This past football season wrapped up with our SBS seventh and eighth grade football teams each finishing an incredible, undefeated season. Each team brought a sense of unity and camaraderie both on and off the field. That, and their coachability. Led by Coach Stephan Simmons (seventh) and Coach Todd Cordell (eighth), these teams overcame injuries, change of positions and other challenges to make it to the end, and they did it with humility and hunger for the game. 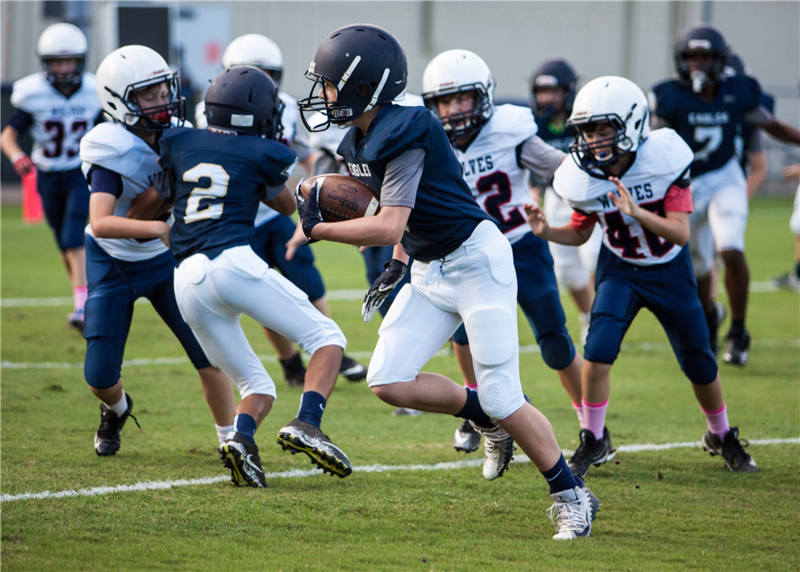 The seventh grade team sustained injuries that might have set other teams back, but because of the players and their willingness to work, they continued fighting for their team. The team motto became, “What really matters is invisible to the eyes.” This allowed our players to look beyond the game and focus on what they wanted to leave on the field – a well-played game to bring glory to God. The eighth grade team finished their season by meeting challenges together, and it paid off as they earned the title of HJPC Champions this season.